Ms. Krista is working on her Education Degree at Central New Mexico Community College. 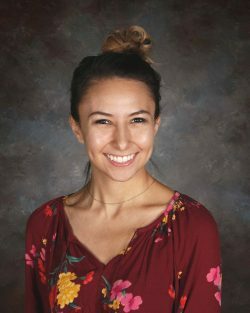 Her journey teaching started in 2012 during her senior year of high school when she volunteered in first grade classes at Mark Twain Elementary School. Last year she aided Mrs. Griesbacher’s second grade class, and she is looking forward to new adventures this year with her kindergarten class. When school is not in session, she takes classes and does private tutoring at elementary levels. Becoming a teacher has always been Krista’s dream, as she loves seeing children light up when they learn something new. The creativity and imagination children have inspire her. Ms. Krista loves spending time with her family and friends. She enjoys a good book, sipping tea, shopping and music. Amber Bigalbal, known to most as Mrs. B, began her career in early childhood education in 2001 as a pre- Kindergarten teacher. She continued to teach pre-k until 2014, when she became a fourth grade teacher at a Catholic School and taught there until the spring of 2018. She will teach Kindergarten at OLA in the fall of 2018. 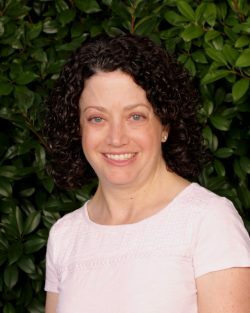 Mrs. B, has her Bachelor’s Degree in Elementary Education with a concentration in Families and Consumer Science, and her Master’s Degree in Curriculum and Instruction. She believes that each child is a unique individual who should have a safe, nurturing, environment that fosters learning and growth socially, emotionally and intellectually. The Catholic Identity is most important to her. She creates a classroom community with an atmosphere animated by the Gospel to help her students grow in the Catholic beliefs. Mrs. B, enjoys traveling with her husband and children in the summer. What some people don’t know about her is that her and her husband sing and play guitar. She also loves to write children’s books in her spare time and would like to publish in the near future. 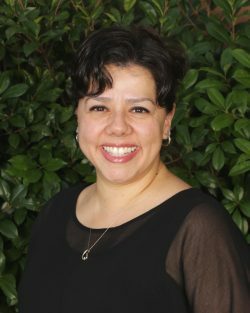 Clarissa Contreras has taught art at OLA for the last 15 years. 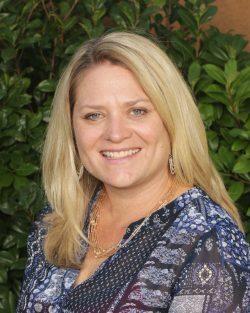 Previously, she taught 3 years in the OLA middle school world studies and science. 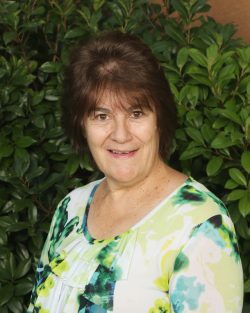 Throughout her 18 years at OLA, she has also taught religion for 6th and 7th grades. 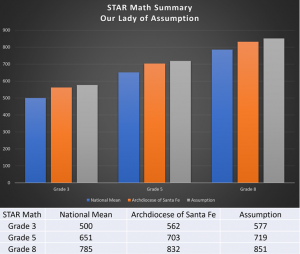 Additional duties have included: lunchroom monitoring, science and world studies fairs, art curriculum development for the Archdiocese of Santa Fe and OLA art and talent shows. 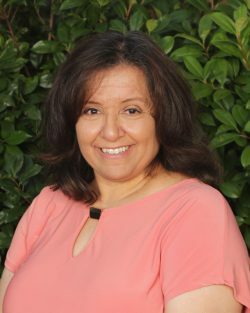 Before coming to OLA, Clarissa taught 5th grade for 6 years in both APS and Los Lunas Public Schools. This school year is her 25th year in education. Currently, Clarissa is married (18 years) and has a daughter in 5th grade attending OLA along with a son, who is an OLA graduate (class of 2017). She is a lifelong parishioner of OLA. 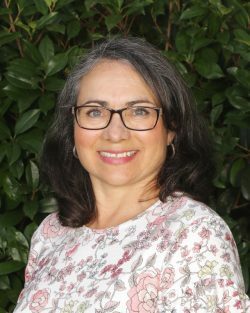 Mrs. Contreras earned her BS in elementary education from University of New Mexico (Social studies endorsement), as well as a Masters degree in Art education. 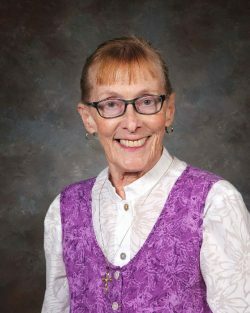 Della is a lifelong resident of Albuquerque, NM and a parishioner of OLA for 45+ years. She is a graduate of Valley High school with Associates degrees in Medical Assistant and Insurance from TVI (CNM). Della has owned a home day care for almost 20 years. She also has retail managerial experience with Regis corporation, Firestone Tires, as well as nurse assistant for a private medical doctor practice. Della is the mother of four, grandmother of ten and great-grandmother of two. Ms. Jennifer Davis received her B.A. 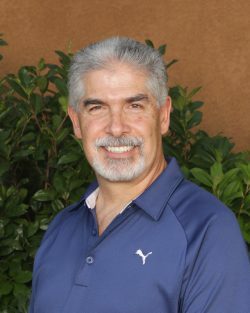 in Psychology, with a concentration in Sociology from the University of New Mexico and a Masters in Education with an endorsement in Reading and Language Arts from Wayland Baptist University. In 2009, she began her educational career at Hawthorne Elementary School student teaching in 2nd grade. She began working at Our Lady of the Assumption Catholic School in 2010, first in Jr. Kindergarten, and is currently in Kindergarten. She has 3 children, two of whom currently attend OLA, and the oldest who is an OLA Alumni. She loves spending time with her family and friends. She enjoys music, reading, movies, shopping and is currently working on her new e-commerce business. Jane Davalos Mrs. Davalos received her B.A. in Bilingual Education from Cal State Long Beach and an M.A. 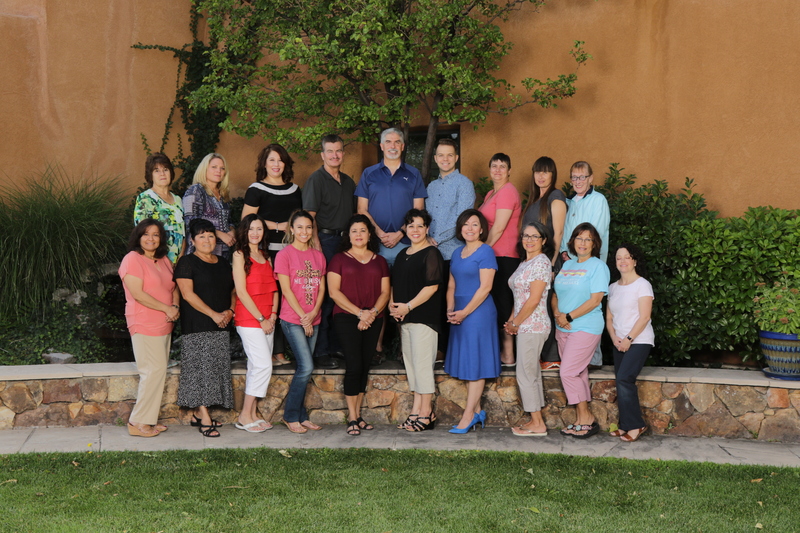 in Elementary Education from the University of New Mexico. 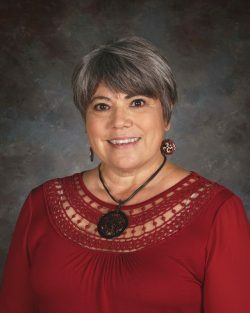 She worked as an elementary dual language teacher for Albuquerque Public Schools and retired after 30 years of service. She holds both a Bilingual Endorsement and an Early Childhood Endorsement as well. This will be her third year teaching Jr. K at O.L.A. and she has enjoyed it tremendously! Her son, Joel, and her daughter, Erica, are O.L.A. alumni, as well as her husband, Don, from years back when things were very different at O.L.A. She considers it her highest calling to teach 4 year-olds to love Jesus as He loves us. She finds it most challenging and yet very rewarding when she takes a step back and gives her students real think time, processing time, and a chance to solve problems without her. Her favorite part about teaching Jr. K is watching her students make tremendous leaps and bounds in their growth and development throughout the school year. 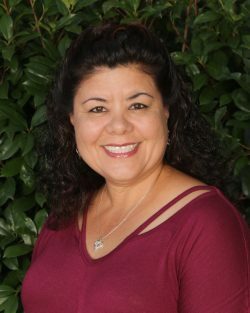 Mrs. Davalos loves traveling, trying new recipes, and spending time with her family. She also enjoys hiking, ping pong, Lobo basketball and volleyball, exploring art museums and road trips that take her off the beaten path. 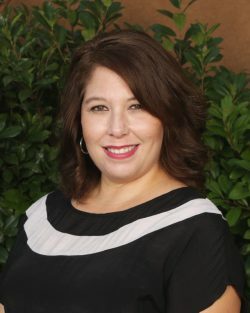 Michelle Everett received a Master of Business Administration degree from the University of Phoenix in 2007 and a Bachelor of Science in Business Administration from the University of Phoenix in 1997. Previous education included a Bachelor of Arts in Fashion Merchandising from Parks Business College and Certified Electro-Mechanical Draftsman from Albuquerque’s Technical Vocational Institute. Michelle is now pursuing obtaining a teaching certificate/license. Michelle Everett is currently working in Our Lady of the Assumption’s Parish Office performing various office administration activities including records management and maintenance. She also works at the Catholic Foundation as an independent contractor supporting monthly banking and investment reconciliations. During the school year, Michelle works the Aftercare Program at Our Lady of the Assumption Catholic School. This includes tutoring the children during the homework designated time. She is also an active substitute teacher at the school and available throughout the school year. These have turned out to be her favorite jobs as the children are amazing and so very special. No job has been as rewarding. 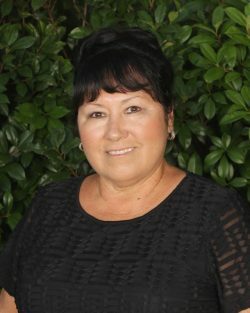 Michelle relocated back to Albuquerque in July of 2016 after retiring from a successful career at Honeywell Inc., Satellite Systems Operations in Glendale Arizona. 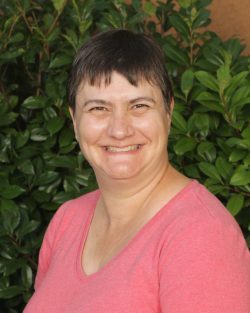 She worked at Honeywell for 31+ years, starting out in Albuquerque, as a Draftsman and retiring in Arizona after working the last 15 years as a Senior Program Quality Engineer, supporting National Programs. Michelle enjoys spending time with her family, which is what brought her back to Albuquerque. She also enjoys spending time with her dog, Sam, a 130 pound Rottweiler. They take regular morning and evening walks, visit with friends and love swimming at the lake whenever they make a trip back to Phoenix. In her spare time, Michelle enjoys golfing, reading and hiking. Ms. Elaine Geissler is an Albuquerque native. 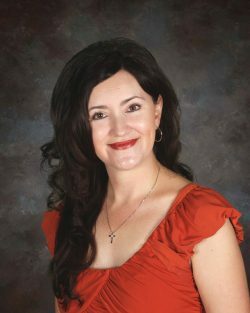 She attended Our Lady of the Annunciation Catholic School, graduated from Sandia High School, and received her BA in Anthropology from UNM and her Post-Baccalaureate in Elementary Education from UNM. She has endorsements for middle school math. Ms. Geissler’s teaching career began at Ernie Pyle Middle School where she taught math for 2 and a half years. She then moved over to Madison Middle School and taught math for 23 years. She retired from APS and will be starting her 2nd year teaching 6th, 7th, and 8th grade math here at OLA. Ms. Geissler has always dreamed of teaching at a Catholic school and is very grateful for the opportunity and for her students. Ms. Geissler enjoys hearing of her former students’ accomplishments. Many have gone on to some of the top universities in the country. Several have become teachers and others have pursued careers involving mathematics. Teaching math is her passion and she loves seeing her students learn and excel. Ms. Geissler resides in Albuquerque with her two daughters, Natalia and Marina. Natalia is a junior at St Edward’s University in Austin, TX, and Marina is a senior at Sandia High School. Additionally, her 87 year old father, Henry, lives in Albuquerque as do three brothers and their wives. She also has two sisters who live in San Antonio, TX. She enjoys spending time with her family, reading, gardening, hiking, and watching the Steelers and the Penguins play! Mrs. Laura Goodyear received her B.S. in Elementary Education from Illinois State University. She’s worked as a 5th Grade teacher in Galveston, Texas for ten years where she lead the 5th Grade team of teachers. While staying home with her kids, Sean and Adam, she enjoyed being in mom’s groups and teaching Vacation Bible School at St. Joseph on the Rio Grande in Albuquerque. She came to Our Lady of the Assumption Catholic School in 2010 and has taught 3rd Grade for seven years. Her favorite memories are when students have discovered their talents and used them to do well in class and shared them with classmates. She also enjoys the excitement of students learning new skills, trying new teaching strategies, and watching her students grow up as they continue through the upper grades. Mrs. Goodyear loves to read, go to movies, shop, eat out, play guitar, and especially spend time with family! 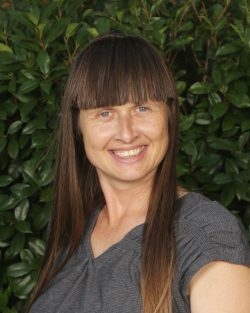 Mrs. Griesbacher-Lyle received her Bachelor of Arts in Education at the College of Santa Fe in Albuquerque and attended Highlands University to earn ‘half’ a masters degree in Mental Health Counseling. She taught second grade at Tohajiilee Community School in 2003/2004 and has been teaching at Our Lady of the Assumption Catholic School since 2004. She taught second grade until 2007 when she taught one year as the fourth grade teacher. Then she took time off to be with her daughter in 2008; however, during that time she also substitute taught at O.L.A. for three years. Upon her return she was able to reobtain her position as the second grade teacher. Teaching second graders is her passion. She believes in hands on learning and her teaching paradigm is based on students’ many learning styles and abilities. She also enjoys encouraging the development for the love of reading within each of her students. She incorporates project based learning in Science and World Studies and loves to create scientific investigations to enhance the learning of scientific concepts. Mrs. Griesbacher-Lyle loves spending time with her husband and daughter Maggie, which will be starting fifth grade 2017/2018 school year. She also enjoys motorcycling, geology (rocks and minerals), entomology, outdoor activities, four wheeling, and exploring our beautiful state of New Mexico. Mrs. Maria Hatch is a native of New Mexico. She currently lives in Las Cruces, and is moving to Albuquerque the summer of 2018. She attended elementary school in Las Cruces, both at Immaculate Heart of Mary and Holy Cross Catholic Schools. She has found memories of her years at Catholic Schools, and believes they helped shape her commitment and appreciation of a Catholic School education. She received her BA in Education from NMSU. Mrs. Hatch’s career began at Alameda Elementary in Las Cruces, NM. 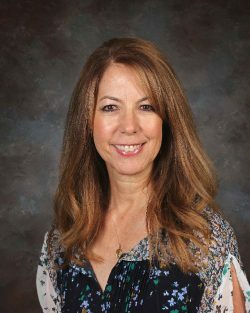 While at Alameda, she’s taught both second and fifth grade for the past 22-years. 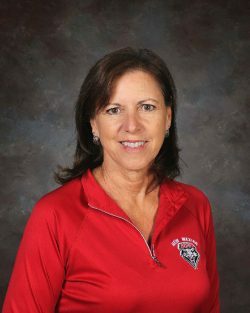 Mrs. Hatch has retired from the Las Cruces Public School District and will be a new teacher at OLA. Mrs. Hatch loves teaching, and was blessed with the opportunity to continue her teaching career at OLA. Mrs. Hatch is looking forward to her move to Albuquerque, because she will be closer to her daughter’s family and most importantly-her 18-moth old granddaughter. Whom she cherishes! Jesus Hernandez keeps our school immaculate and in great working order! He has been with OLA for 5 years and is retired from APS after 25 years of service primarily working at Taft Middle School. Jesus is married and has two sons and a daughter and is a grandfather of 3. Jesus enjoys taking his grandchildren to the park to play and watching movies. He enjoys the interaction with the OLA students and the students will tell you the same. Mrs. Faith Johnston received her B.S. in Construction Engineering from the University of New Mexico and is currently working towards her M.S. in Library and Information Science at Drexel University. She worked at Parsons Brinckerhoff designing roads, bike paths, construction phasing and signing, and estimating the cost of constructing these types of projects. She stayed home with her daughter Clara from 2004 until 2011, while working as the accounts manager at Wayjohn Surveying, Inc. She began working at Our Lady of the Assumption Catholic School in 2011 as an Educational Assistant (E.A.). She has worked as an E.A. in JK through 2nd grades for the past 5 years. She started working as the librarian/media center specialist in 2016. 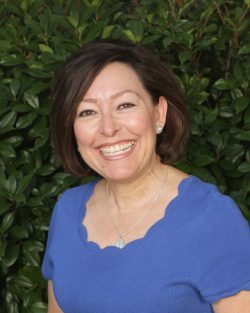 Rebecca Maestas-Sanchez has been OLA’s school leader since 2017. She was formally educated at New Mexico Highlands University where she earned a Bachelors degree in Elementary Education in 2007. Rebecca was a classroom teacher for 10 years teaching 3rd grade, middle school Social Studies and Religion before graduating with a master degree in educational administration and leadership from Creighton University in 2017. Rebecca as well as her four children are a product of Catholic education. In her spare time she enjoys travelling and cooking. Debbie Marino works with Early Childhood. She enjoys assisting and helping prepare the children for their next grade level. This coming school year Ms. Debbie will be with OLA three years in Kindergarten. Debbie has volunteered with Pre-K through third grade as well as in the library. She volunteers with various school activities and helps with the Uniform Store too. Debbie feels blessed to be in an environment, where prayer and learning about God, is a part of a child’s education. She has two grandchildren attending Our Lady of the Assumption. She enjoys family vacations, going to the movies, gardening, and spending time with family and friends. Mrs. Saiz received her B.S. in Computer Science and her M.D. from the University of New Mexico. She’s worked as a programmer for IBM before returning to NM to attend Medical School. 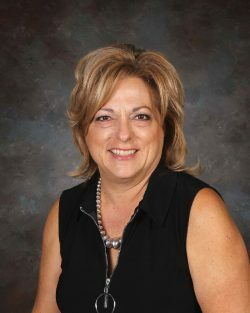 She volunteered as an HSA officer before joining Our Lady of the Assumption Catholic School in 2006 to pioneer the computer program helping to raise parent satisfaction level to 98% from 27%. She also directed the Rosetta Stone Program for a couple of years. 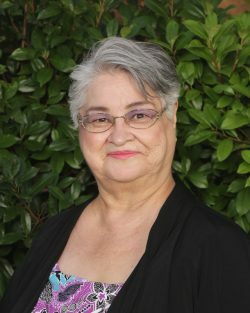 Her favorite memories are when she was able to help staff and students solve computer issues. In a world of ever changing technology she enjoys learning and helping students learn about technology challenges on a daily basis. 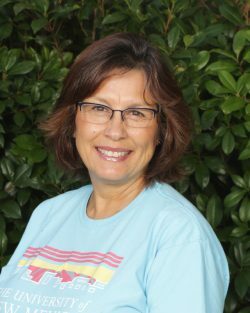 Mrs. Saiz loves to read, travel and spend time with her family. She also enjoys walking her dog, and figuring out puzzles! David Sauter is the physical education and health teacher at Our Lady of the Assumption Catholic School. Mr. Sauter has over 30 years of teaching experience including both elementary and middle school. 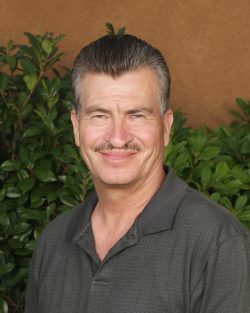 He received his Bachelor of Science degree in Elementary Education from the University of New Mexico, and a Master’s in Education, also from UNM. 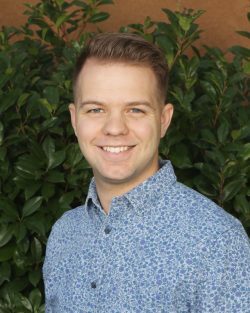 Mr. Sauter joined the OLA staff in 2016. Mr. Sauter enjoys athletic activities of all kinds. He is also fond of music, movies, traveling, and spending time with his family. Mr. Sauter’s goal for his classes is to promote a healthy lifestyle, teach the skills of athletic activities, and of course, to have fun. Mrs. Sweeney retired from APS, where she worked in the Special Ed department for 21 years. Mrs. Sweeney has been at Our Lady of the Assumption Catholic School for 3 years as an Educational assistant in the first grade. Mrs. Sweeney has been faithfully enlightened since being at Our Lady of the Assumption school. Mrs. Sweeney has two daughters. The oldest is married with three children; while her youngest is seeking a degree in counseling at CNM. Mrs. Sweeney loves spending time with her family and also enjoys shopping and eating out. Mrs. Sweeney believes that teaching should be student – centered and students should be accountable for their learning and behavior. As a teacher’s assistant, she helps her students acquire the communication skills, problem solving skills, and critical thinking skills, which will enable them to be life long learners. She believes students should learn to be independent but still have the skills necessary to work constructively as a team. Mrs. Sweeney looks forward to meeting and working with each and every student. Mrs. Mary Wentworth received her BA in English and Speech & Theater and her MS in Counseling Education from Indiana University. Mrs. Wentworth is a teacher as well as a licensed school counselor. Before moving to New Mexico, she and her husband lived in California where she taught school and worked as a case worker for the blind, mentally ill, mentally challenged and industrially injured. 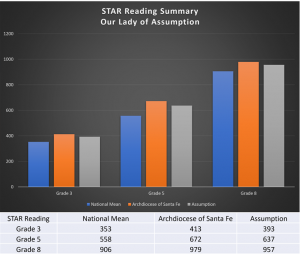 When she and her husband moved to Albuquerque, she obtained her New Mexico State Teaching License and began teaching for the Archdiocese of Santa Fe. She taught for two years at St. Charles, and upon the request of her Pastor at that time, Fr. Luis Jaramillo, moved to Our Lady of the Assumption where she has been ever since. She is the seventh and eighth grade homeroom teacher and teaches Religion, Language Arts and Literature to the 6th, 7th, and 8th grades. Mrs. Wentworth loves the Church, children and animals. In her spare time, she does a lot of work for the Church, and she is an avid reader. Quote she loves: “Intelligence plus character – that is the goal of true education.” Martin Luther King, Jr.
Rhonda Yrene was born and raised in Albuquerque and is an alumni of Our Lady of the Assumption Catholic School (1981). Her childhood home is only a block away from the school. Rhonda and her husband are Highland High graduates and were high school sweethearts. Rhonda attended NMSU along with ENMSU and other colleges in AZ. She has been married to Golf Professional, Don Yrene for 30 years and has 3 beautiful children Maia, Adam, Jake and a Beagle named Gabbie. 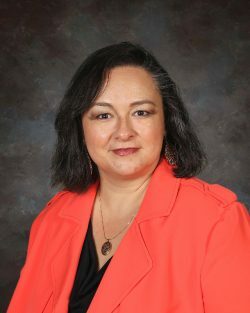 Her husband’s new position here in Albuquerque moved their family back to her roots from Bourbonnais, Illinois where she was an Administrative Assistant at Bishop McNamara Catholic School. Rhonda is passionate about her faith, family and friends. She is hoping the Land of Enchantment will be her final destination for many years to come. Rhonda loves the out doors and loves to read and spend time with her children, family and friends. Her faith is what gets her through life and is happy to be employed at OLA where she grew up.